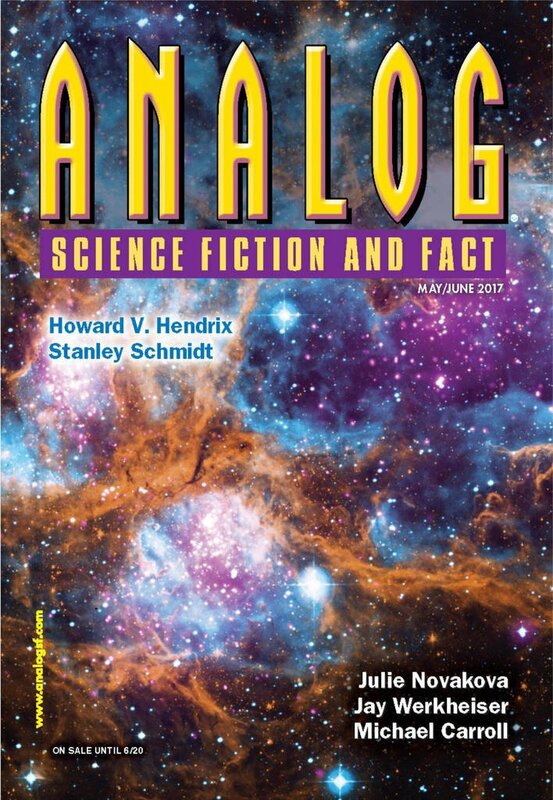 "In the Mists," by Bill Pronzini [bio] and Barry N. Malzberg [bio] (edited by Trevor Quachri), appeared in Analog Science Fiction and Fact issue 05-06|17, published on April 20, 2017 by Penny Publications. The opening sections have a strong as-you-know-Bob feeling to them; he's explaining things he already knows and has already written about. Beyond that, his situation just isn’t that interesting, since he’s not trying to rescue himself. Once we learn he’s been imprisoned because of a malfunction in the machine that was supposed to medicate him on his ship, suspension of belief collapses. What that has to do with Schrodinger’s cat is anyone’s guess.